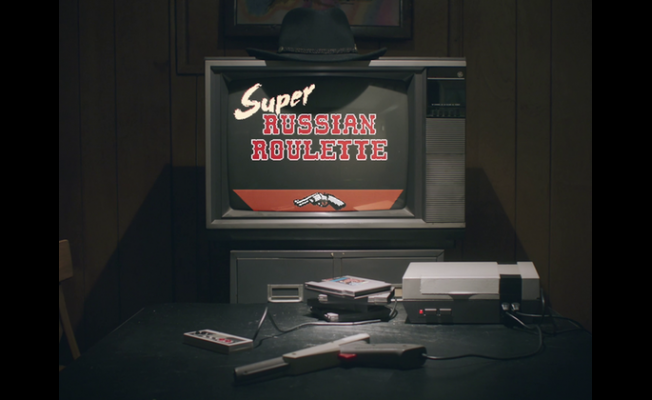 Full service production company LightHouse Films’ Ray Zablocki directed the hilariously quirky :60 online ad for new retro videogame Super Russian Roulette, created by Batlab Electronics for the classic NES, the original 8-bit videogame system from Nintendo first introduced to consumers in 1983. Proving the adage that ‘everything old is new again,’ full service production company LightHouse Films’ Ray Zablocki directed the hilariously quirky :60 online ad for new retro videogame Super Russian Roulette,created by Batlab Electronics for the classic NES, the original 8-bit videogame system from Nintendo first introduced to consumers in 1983. The online ad played a key role in a hugely successful Kickstarter and product launch campaign that raised nearly $85,000 ($65,000 more than its original $20,000 goal), enabling Batlab founder/game designer Andrew Reitano to fully fund the project, now available via the website www.superrussianroulette.com. According to Zablocki, new, original games developed for classic video game systems, like the NES or even stand-alone arcade games, is a growing niche among gamers. Shot using the Arri Amira camera paired with vintage Zeiss Super Speed MKII lenses, the spot nods to ads from the 1980s in tone and style. Opening on three bored slackers desperate for something fun to do, one says: “if we don’t do something soon I’m going to shoot myself.” That sets off a light bulb as they race to their suburban basement circa-1983 where a classic NES system and an old television sit, complete with a cowboy hat on top. For Zablocki, finding a way creatively to bridge the actual game footage with a live action element proved one of the more challenging aspects. LightHouse Films’ Partner Thibaut Estellon notes the spot is yet the latest example of Zablocki’s unique creative style and deft touch with humor -- on display in his recent branded content work for IKEA, Google and Sotheby’s. “Ray has a real gift for offbeat humor, and expertly marrying live action and visual effects, and this spot proved the perfect opportunity to showcase all of his talents,” Estellon says. LightHouse Films is a full service production company based in New York that strives to create high-end commercial, digital and branded content. They represent some of the best emerging directors in the industry who share their love of creating compelling and engaging short and long form video content for some of the leading agencies and brands in the U.S. and abroad. Click here for more info: http://www.LHFNY.com.